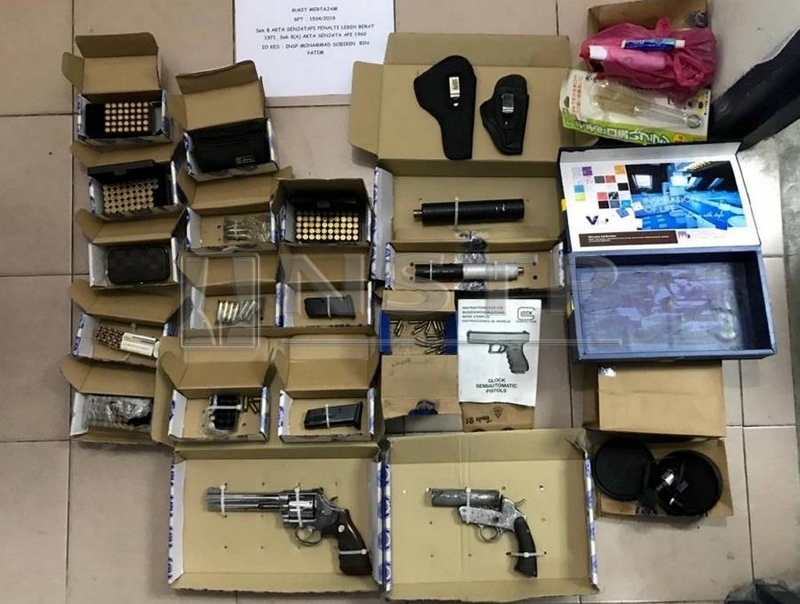 BUKIT MERTAJAM: Police seized a hand grenade, pistols and hundreds of live bullets from a double-storey house in Taman Bukit Indah here, on Sunday. The house was last raided in December when police uncovered a drug processing laboratory on the premises, and seized more than RM700,000 worth of ecstasy pills. The drug discovery was made after the homeowner revealed that his tenant had disappeared after leaving the house vacant for six months. The same homeowner led police on the latest raid at 2.40pm yesterday, and a report was lodged after the ammunition and weapons were discovered. “The items had been kept inside a room on the first floor. “After more than an hour’s search, the raiding party found more than 349 live bullets and pistols inside the headboard (of a bed). “A further search led to the discovery of an active hand grenade,” said Seberang Prai Tengah district police chief Assistant Commissioner Nik Ros Azhan Nik Abd Hamid. He said the items seized include a US-made M61 hand grenade, a Smith & Wesson (Magnum) pistol, a home-made pistol, two silencers, a laser shooter, bullet shells and casings. Nik Ros Azhan added that they also seized an assortment of live bullets, including 42 Thai ARM .38 SPL live bullets, 50 black Thai ARM bullets, 50 Thai ARM live bullets and 39 PMC .38 live bullets. “We are now on the hunt for the tenant. “We have identified the suspect as a 42-year-old man with a criminal record of 16 drug offences,” he added. The case is being investigated under Section 8A of the Firearms Act 1960 and Section 8 of the Firearms Act (Increased Penalty) 1971. Nik Ros Azhan said that the grenade will be detonated tomorrow by the Bomb Disposal Unit.